2. Cuddling with my furry friends - Animals are such a blessing; directly hooked up to Life or 'The Mystery' as we like to call it... When Kylo and DaPuss come lie down against me, I take it as an honor. They're so pure and sensitive, they wouldn't do so unless they felt safe and resonated with my energy at that particular moment. 3. Preparing food ... and of course eating the result - Huh, guess this one doesn't come as a big surprise, eh? 4. Taking a walk when big fat snowflakes are slowly coming down - Yet another opportunity to revel in Life's magic. 5. Picking wild berries and edibles - So meditative! It also gives me such a sense of Nature's beauty and abundance. 6. Hummingbirds - To me, these are a perfect embodiement of how magical existence is! I can't help but be in awe whenever I am blessed with their presence. OK, now I get to pass the award along to 7 fellow bloggers and shine the spotlight on their kreativity! I know she's already been nominated, but I simply couldn't NOT mention her as she's one of the most inspiring and kreative person I know! Joyce has only recently started blogging, but boy, is she ever full of creativity and enthusiam for raw food prep! During this not-so-kreativ phase of mine, Joyce's blog has become one of my favorite hang outs! I still can't believe how much Ingrid has accomplished in such little time! You rawk girl! 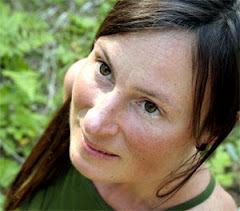 Just hop over to her last post and you'll see what I mean... She has also recently launched a free collaborative work: One Week Raw. Who hasn't marvelled at Tofu's food art? 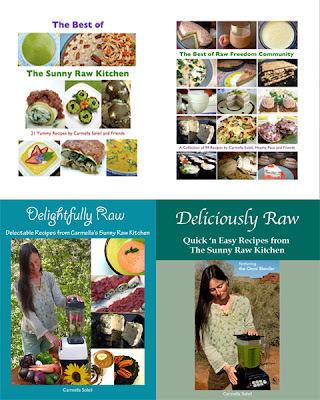 Russell James' The Raw Chef blogRussell has been spoiling us with his amazing raw gourmet creations on his blog and has recently started publishing recipe ebooks. A must 'drop by' spot for all food lovers! This gal's got the eye! Absolutely gorgeous food photography! Thankfully, after hanging in limbo for a while, things are slowly starting to fall into place in terms of our next step. Don and I just received the good news that there will be a home waiting for us in Winlaw, the small community where we spent 6 years prior to moving to Rossland. Although we were prepared to go anywhere, I must admit I'm glad to return to the Slocan Valley. It's so pristine and really laid back, plus we'll have easier access to some great health food stores and organic produce. As for our friends, Pontifex and Mosaica, they'll be heading to Kelowna where Ponti just got a new job. You know how it is around here... we welcome any excuse to whip up something yummy, so this definitely called for a celebration! And what better way than with a decadent sweet treat! As we're trying to empty the freezer for our upcoming move, we found some lovely persimmons that were begging to be used. First we thought of making a simple parfait, but then it occurred to me that my shortcake recipe would also beautifully highlight the persimmons' delicate flavor. I was right! This was so light and delicious! Place dates in food processor and process until a smooth paste forms. You may need to add a little water and scrape down the sides of the bowl a few times. Carmella’s Note: If using ground almonds instead of wet almond pulp, you might want to add a couple of teaspoons of water for moisture. Blend all ingredients except lecithin and coconut oil until smooth. Add lecithin and coconut butter and blend until thoroughly mixed. Pour into a container and set aside in fridge or at room temperature until ready to assemble. *To make coconut milk, blend 1 part dried coconut with 3 parts water in high-speed blender. Form an even layer on the bottom of a 7” spring form pan with half of the cake mixture. Top with 1/2 of the persimmons, followed by half of the whipped cream. Put in fridge or freezer to set. When firm, form another cake layer. Then top with the rest of the persimmons. Finish off with whipped cream and set in fridge/freezer. When firm, gently remove cake from the pan and place on serving plate. 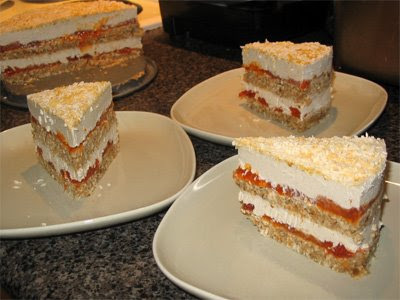 ~ In order for each layer to retain its distinctive shape, it's key to let the whipped cream layer set in the fridge (or freezer) before patting down the cake layer. Yah, yah, I know it's just for visual purposes, but hey! Remember that we taste with our eyes first. 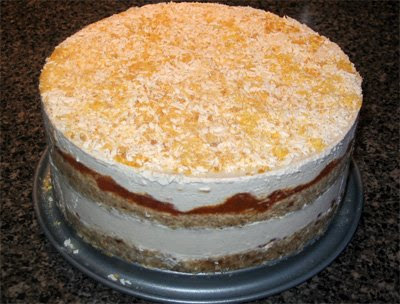 ~ For a simpler version of this, put a cake layer, followed by persimmon. 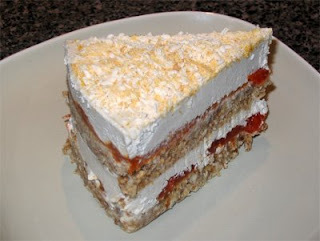 Top with whipped cream and let set in the fridge. Decorate and serve. Perhaps not as impressive but definitely still as delicious! In the last week, the key words around here have been "letting go". I finally decided to take the plunge and ordered kelp noodles... and LOTS of 'em!!! After reading rave reviews about the latter, I finally got around to trying them recently. Wow, now I can see what the rage is about! They have a very mild, neutral flavor that will go well with virtually any type of sauce. Soooooo many possibilities to play with! ! The first thing you'll notice upon opening the package of kelp noodles is the strange smell, but no worries, there's no dodgy chemical preservatives in there. Giving the noodles a good rinse will mostly take care of it. You'll also notice that they're kinda crunchy. Depending on what you're preparing (for instance a salad), this may not be an issue. On the other hand, if you're looking for a pasta effect, you'll want to soften them up. I soaked mine in water for several hours and while they seemed to enlarge in size, they still remained crunchy. *scratching my head* After some research, I found out that the key is to let the noodles sit in something acidic (such as lemon juice or vinegar) for a few minutes in order for them to get soft. Don't ask me why, but it DOES work! In the following recipe, the Peanut Sauce contains some lime juice so you can toss the noodles directly in the sauce and it does the trick. Addictive stuff! Blend until smooth. If necessary, add more water until desired consistency is reached. Place rinsed noodles and veggies in a large bowl. Toss with desired amount of Peanut Sauce. Let sit on the counter or in the D for 30 minutes before serving. 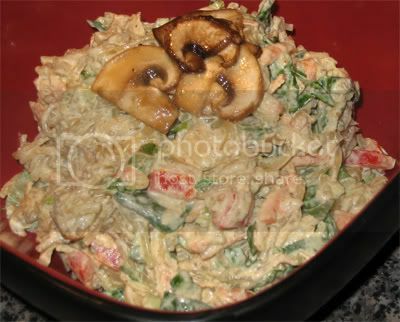 Optional: Top with sliced mushrooms marinated in a little olive oil and tamari. ~ When I first made this, I left the dish for an hour on the counter, then popped it in the D for an extra hour. Not a good idea! The noodles had that 'overcooked' texture to them. (If you've left pasta cook for too long before, then you know what I mean!) Most recipes I've come upon suggest to let the noodles soak up the marinade or sauce for about 30 minutes before serving. ~ For a simpler variation of this, you could skip the veggies and just toss the noodles in the sauce.